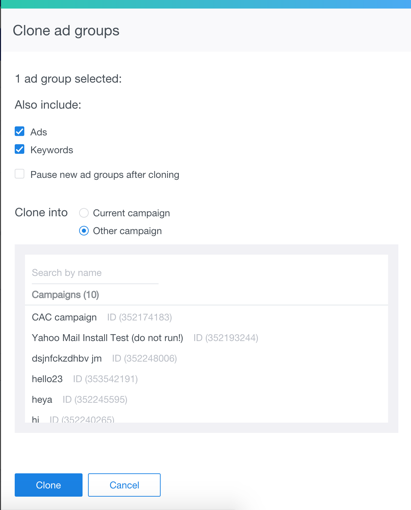 Use Cloning to replicate your ads, campaigns and ad groups across multiple locations in the Native & Search UI, with minimal effort and a few simple mouse or keyboard clicks. 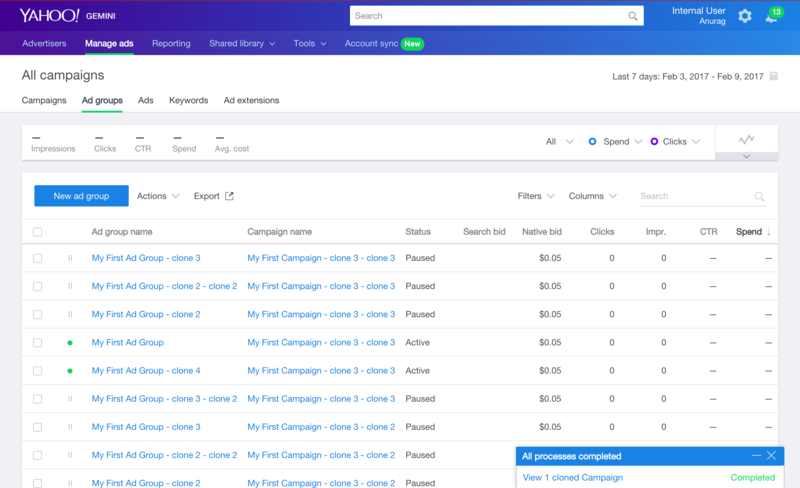 Cloning lets you take advantage of your most successful ad assets, ad groups and campaigns by enabling you to create similar ones for use with different settings. 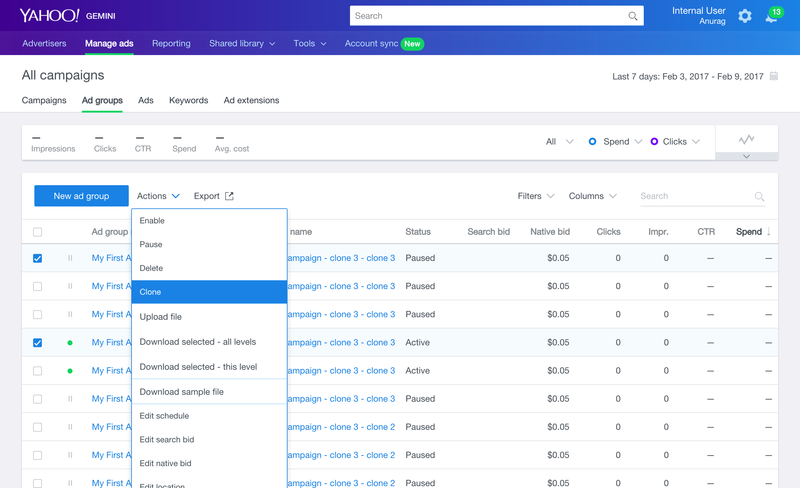 Once you select the ad groups that you wish to clone, for example, you can simply select the Clone option in the Native & Search Actions dropdown menu. 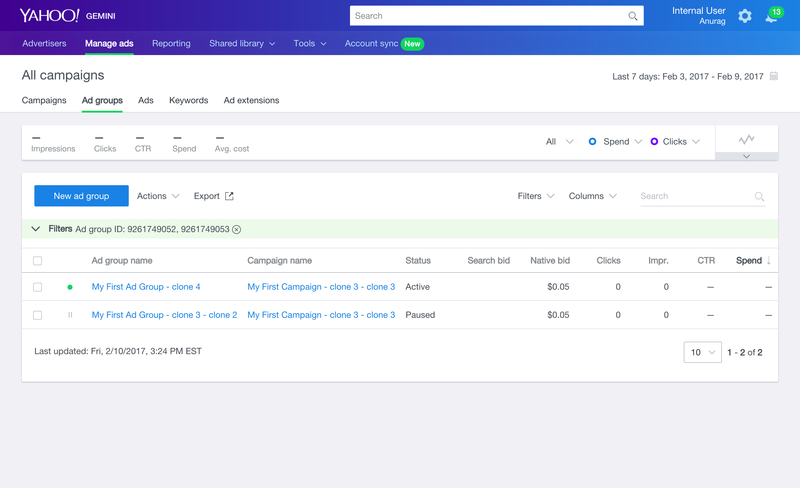 Use Cloning to leverage the time and effort spent on creating your Native & Search campaigns to drive more business results and ROI. You can increase volume, both traffic and impressions on new and additional supply from Oath, when you replicate your best and most successful assets. Follow these steps to clone your ad groups. The steps are similar as well for cloning your campaigns and keywords. Begin by identifying the ad groups you wish to clone in Ad groups. Select the ones to clone from the list in Ad groups. Once you’ve decided, click Clone from the Actions dropdown menu. Shell cloning: Clone just the ad group (selected) or also include the ads and keywords underlying in that ad group. 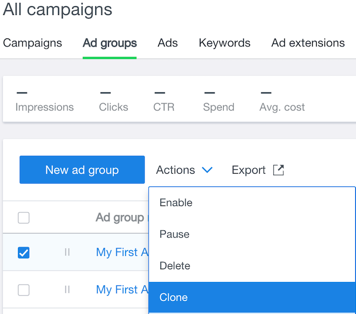 Cross-context cloning: Clone ads to a different ad group, campaign, or advertiser, when you click one of the Clone into radio buttons for either the current campaign or another campaign that you’ve selected in the list below. You can also pause new ad groups once you’ve cloned them. Native & Search is now processing in the background the ad groups that you’ve selected to clone. Now click the text link in the bottom-right corner of the drawer to view the cloned campaign. In this example, the text link shown is: View 1 cloned Campaign. In the Ad groups tab, Native & Search provides you with reporting on the ad groups & campaigns that you’ve cloned.